We’d love your help. Let us know what’s wrong with this preview of The Testing Guide by Joelle Charbonneau. In the scarred and war-battered United Commonwealth, ten-year-old Cia Vale watches her older brother Zeen dream about being chosen for The Testing. He's graduated at the top of his class, and being chosen, like his father was before him, means a chance to attend The University and help lead the effort to revitalize postwar civilization. Cia is conflicted--she hopes Zeen is In the scarred and war-battered United Commonwealth, ten-year-old Cia Vale watches her older brother Zeen dream about being chosen for The Testing. He's graduated at the top of his class, and being chosen, like his father was before him, means a chance to attend The University and help lead the effort to revitalize postwar civilization. Cia is conflicted--she hopes Zeen is chosen, but dreads him leaving home. She also realizes that one day she too must set her mind on being chosen. But does she realize the deadly path she will have to take? To ask other readers questions about The Testing Guide, please sign up. What Women Born In The 80's Are Reading In 2017. First off, it's a darn good thing this puppy was free, or there would've been a lot of irate people out there. I wouldn't even say it qualifies as a short story--it's a bonus chapter, one that really can't be included in the book because the book is told in first person by a different character. I can't say that it particularly adds anything to the book--the only reason I'm rating it as high as I am is because I happen to like Zeen from the few small glimpses we've been given of him. All we get First off, it's a darn good thing this puppy was free, or there would've been a lot of irate people out there. I wouldn't even say it qualifies as a short story--it's a bonus chapter, one that really can't be included in the book because the book is told in first person by a different character. I can't say that it particularly adds anything to the book--the only reason I'm rating it as high as I am is because I happen to like Zeen from the few small glimpses we've been given of him. All we get from this chapter is that Zeen resents not being chosen for The Testing (which we already knew) and that he sticks around only for the sake of his sister, Cia (which we could pretty much figure out). What this chapter did give me is 1) hope that Zeen will be given a more prominent role in future books and 2) an answer to where Tosu City actually lies, which I admit I was quite curious about. I am really interested in reading the series. It was slightly different than I thought it would be. Also, even with just a small bit of material, I was able to get a lot of information about the world that the characters live in and feel somewhat attached to the the characters. So, I think that the main books for the series must be something to really look into reading. This is the shortest short story I ever read.. The free prequel can be downloaded here. I liked The Testing Guide but this was WAY shorter than I expected it to be. Most of it was just a preview of The Testing. This can hardly be considered a "short story." Nonetheless, The Testing Guide was interesting. I've heard of The Testing but never actually knew what it was about. Now that I've read this, I'm more interested in starting the series. But like most prequels, this really was pointless. I can't say I see the point of this. It's an okay set-up for the series, because it explains so I liked The Testing Guide but this was WAY shorter than I expected it to be. Most of it was just a preview of The Testing. This can hardly be considered a "short story." But like most prequels, this really was pointless. I can't say I see the point of this. It's an okay set-up for the series, because it explains some things but it was too short to actually get anything across. If this was just more in-depth, I would have really liked it. It's free, which is great. It doesn't really add a lot in terms of the world or story, but if you just want to read a little bit more, it's good for that purpose. I typically love novellas but don't find this one to be a necessary read. If you are a die hard fan of the story, then downloaded it for free. There's nothing to lose, so you can give it a try and decide for yourself. Literally the shortest novella I have ever read. It's only one chapter and then the rest is part of the first book, The Testing. But I did like seeing more of Zeen and hope that the author showcases his character more in the next books, or does a full novella with him. I liked this short story, but I was surprised that the main character in the story is not Cia, but her oldest brother. It kind of made me a fan of him, and wished he was the mais character of the story, since I liked him from first page... I’m kind of asking myself what’s happened to him???? This eleven-page story, teaser prequel to novel, The Testing (with a forty-page excerpt of The Testing after the prequel story), sets the scene locating the future post-apocalyptic world of The Testing in a post-war North America a century after war and global catastrophes destroyed much of the Earth's population and biomass leaving coastal cities submerged and toxic tainted soil. The prequel tells the story of Zeen (elder brother of The Testing's protagonist Malencia - "Cia") and how it was that This eleven-page story, teaser prequel to novel, The Testing (with a forty-page excerpt of The Testing after the prequel story), sets the scene locating the future post-apocalyptic world of The Testing in a post-war North America a century after war and global catastrophes destroyed much of the Earth's population and biomass leaving coastal cities submerged and toxic tainted soil. The prequel tells the story of Zeen (elder brother of The Testing's protagonist Malencia - "Cia") and how it was that Cia came to have a burning ambition to be chosen for the Testing, after what happened to her brother. Young adults who desire one of the few University places hope to be chosen for the Testing - a strenuous examination which is not merely academic - Zeen's father, who passed the Test, (despite being subject to the procedure to take away the memories' of Test subjects ensuring secrecy) reveals that he wasn't the first in his class of the applicants during the Testing, but those smarter students didn't make it. This is a short 45 page prequel to The Testing. It also includes the first three chapters of the book. Once again, I'm really not sure if this prequel would make me want to go out and purchase the book. 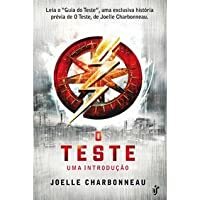 The Testing Guide gives a basic backdrop to a world destroyed by war, earthquakes, and bad weather. Resources are limited. Graduates of school compete to get a place in the capital city for the Testing which upon successful completion ensures a spot in university. It kind of has The Hunger Games This is a short 45 page prequel to The Testing. It also includes the first three chapters of the book. Once again, I'm really not sure if this prequel would make me want to go out and purchase the book. 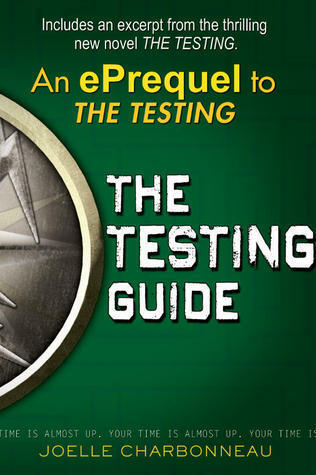 The Testing Guide gives a basic backdrop to a world destroyed by war, earthquakes, and bad weather. Resources are limited. Graduates of school compete to get a place in the capital city for the Testing which upon successful completion ensures a spot in university. It kind of has The Hunger Games feel to it, but it's kind of early to make that assumption. As I received a copy of The Testing for review, I think I will continue reading, just to satisfy my curiosity. Well... I had hoped for a bit more story and I am a bit disappointed. You got about 10 pages of bonus story, and 3 or so with a bit of history information, and after that a first look at the Testing. Which is a shame. I am now still not sure if I should read the Testing or not. For now I am lingering to the no. It was an interesting story, but also slightly confusing. Still don't understand stuff about the testing or what it means, and I was hoping this story would let me know a bit more. This was a nice introduction to the book. I had already read the first chapter of The Testing prior to reading this. This is very short, took me about 10 minutes to read it. Not much to it. Gives just a bit of background on the world and a few of the characters. Looking forward to getting into the book now! Seriously?! It looks like it's a 50-page prequel but it's really just 10 as the rest is made up of the first three chapters of 'The Testing'. It just wet my appetite and then it was all over. It's Zeen's story of his graduation day and I wanted to know more. So much more. Bit disappointing, obviously I expected too much. Intriguing beginning pages to the full length novel, a very very short teaser to what is to come in the future for Cia and her friends. Currently reading the book and already in a short period of time over 100 pages and am fascinated and looking forward to finding out more. May be one of my new favorite series found from Netgalley. This was a very short story (less than 1 chapter), which shows Cia's older brother, and how he failed to get into the Testing, and instead stayed at home and encouraged his sister's dreams of getting into the testing. The other 80% of this book is an excerpt from book 1. I really enjoyed this short prequel. It really gave me an insight to this course and really piqued my interest and curiosity for the first book. I can't wait to find out more about this dystopian world. Quick glimpse into Zeen's life. I wouldn't pay $ for it as short as it is, but it is curious. (I obviously am not used to 0.5, 1.5, etc books). I don't like how this new world is explained.. & I still don't get it..
A nice appetizer- looking forward to reading the testing! This is about ten pages of Zeen's POV on graduation day. It didn't provide any ground breaking insights into the story or characters. Nor was there any excitement. Great companion piece. Read it AFTER The Testing. Pequeña precuela de la historia original de la serie La Prueba , que relata un momento al que se hace referencia en los libros muchas veces pero que nunca se termina de explicar del todo. (view spoiler)[El relato cuenta el momento de la graduación de Zeen, el hermano mayor de Cia, que como se dice en los libros, no fue elegido para ir a La Prueba a pesar de ser uno de los más brillantes estudiantes. Al descubrir que no es elegido, pretende irse por su cuenta a la ciudad, pero finalmente su padr Pequeña precuela de la historia original de la serie La Prueba , que relata un momento al que se hace referencia en los libros muchas veces pero que nunca se termina de explicar del todo. (view spoiler)[El relato cuenta el momento de la graduación de Zeen, el hermano mayor de Cia, que como se dice en los libros, no fue elegido para ir a La Prueba a pesar de ser uno de los más brillantes estudiantes. Al descubrir que no es elegido, pretende irse por su cuenta a la ciudad, pero finalmente su padre consigue hacerle reflexionar y decide quedarse y descubrir de su mano los peligros que conlleva el exterior de su colonia (hide spoiler)]. (view spoiler)[Al principio pensaba que el relato trataba sobre Cia, hasta que en un momento se descubre que es Zeen el protagonista. Quizás eso es lo que más me sorprendió de la historia, junto con el juego del título del libro (así se llama el libro preparatorio para La Prueba usado por Zeen) y el final, en el que aparece una joven Cia que, tras encontrar el libro preparatorio, rellena a escondidas uno de los exámenes, como una especie de presagio de su futuro (hide spoiler)]. When I saw this I got extremely excited because I thought it was going to be a full book about life before Cia's selection into The Testing. The first chapter focuses on Zeen's graduation day and the shame he feels when he isn't selected into The Testing. It was interesting because if you have read the series you know the truth behind what The Testing is. I liked how it talked about Zeen saying it was okay to encourage Cia's dreams. The second chapter just showed some Testing questions and the a When I saw this I got extremely excited because I thought it was going to be a full book about life before Cia's selection into The Testing. The first chapter focuses on Zeen's graduation day and the shame he feels when he isn't selected into The Testing. It was interesting because if you have read the series you know the truth behind what The Testing is. I liked how it talked about Zeen saying it was okay to encourage Cia's dreams. The second chapter just showed some Testing questions and the answers to them. I was really sad because I thought it was going to be a lot longer. While I'm happy to perform for an audience, I am equally delighted to teach private voice lessons and use my experience from the stage to create compelling characters on the page. I am the author of the Rebecca Robbins mystery series (Minotaur Books) I am a storyteller at heart. I have performed in a variety of operas, musical theatre and children's theatre productions across the Chicagoland area.